The two of them were hiking in the mountains when the 7.8 magnitude quake struck. Shaken but not hurt, they made their way back to Katmandu as quickly as possible to check in on family members and then to offer their assistance to others. Originally assigned the task of loading water jugs on trucks, they then volunteered and were enlisted for their translation skills, and headed out to some of the hardest hit villages with international relief workers. They arrived at one particularly hard hit village, where one of the few standing structures was a small fabric shop. 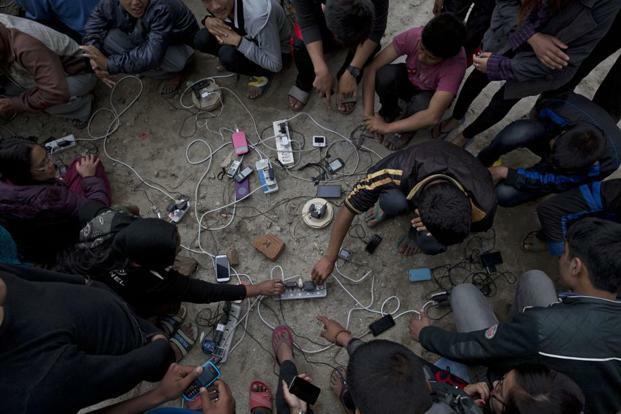 As they entered they were overwhelmed by the number of people gathered, not to get food or water or other supplies, but to charge their cell phones. The couple were both a bit taken aback by the scene, until it dawned on them that people were eager to get news of family members in other villages and to communicate that they were okay. As they moved to other villages, while there were requests for food, water and shelter, they also heard equally strong demands for charging stations for cell phones. That’s when it struck our new acquaintances – connection is fundamental. With these insights, the couple made their way back to Katmandu and promptly sent funding appeals through their various networks and were able to procure a set of solar powered generators that were installed in different schools (public hubs) around the hardest hit regions of the country. The gratitude that was expressed by villagers for this initiative was and continues to be striking to them. And really it shouldn’t be, if we remember how important connection is to, well, everything, from our sense of self to basic safety. Similar stories grew out of the aftermath of Hurricane Sandy. IISC affiliate Michael Premo, with whom I am working on a climate change resilience planning initiative in New York City, relays the discovery made by relief workers that people in many places impacted by Sandy were clamoring for charging locations to stay connected through their devices. This brought a whole new understanding to what might constitute a “critical facility” in resilience planning work. These stories, when viewed through a couple of key frameworks that we have used in our work at IISC, also help us to understand how “critical connections” are key to adaptability and resilience. The Cynefin Framework, for example, illustrates different domains of decision-making that factor in the reality of varying degrees of complexity in a situation or context (including how obvious the link is between cause and effect). 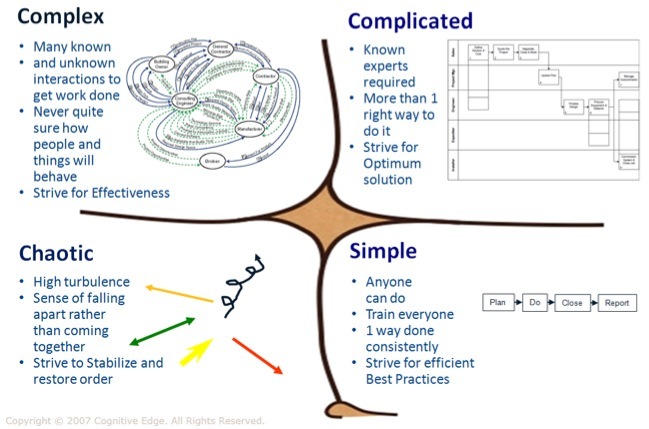 Cynefin offers five decision-making “domains” (see image below)—simple, complicated, complex, chaotic, and disorder—that help people to identify how they perceive aspects of a situation and to make sense of their own and others’ behavior. The “chaotic domain” aligns with what happens during a significant natural disaster, when things are generally confusing and panic may set in. The key is for people to act as quickly as they can to establish order and find sources of stability so that chaos can move into more manageable domains. Maintaining and regaining connection underlie the ability to reestablish stability and find/focus on some semblance of order. 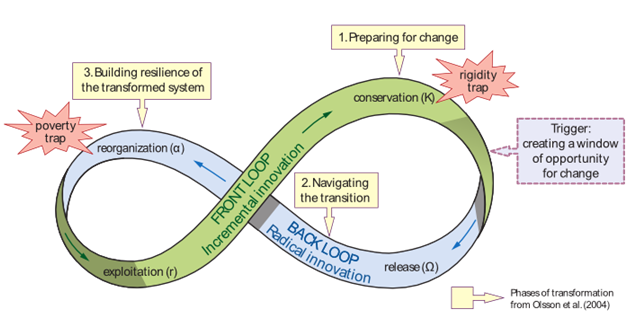 Another key framework to consider is the adaptive cycle, which speaks to how living systems (including ecosystems and human communities) evolve over time and go through natural cycles of development, (relative) dissolution and reformation. At the peak of a system’s cycle of maturity (see #1 in image below), during which it has conserved resources and established predictable patterns and protocols, it threatens to become too rigid and unable to respond to changes in its environment (something which should be very familiar at this time). The key to avoiding collapse at this point is both a release of energy (#2) and embrace of new ways of doing things. Part of the release may entail letting go of certain (especially fixed) patterns of connection, but connection remains key to reorganization, so maintaining some critical connections will be key to resilience and regeneration of new forms (see #3 in image below). Network leadership operates from the understanding that the nature and pattern of connection in a system underlie its state of health (including justice, prosperity, resilience). 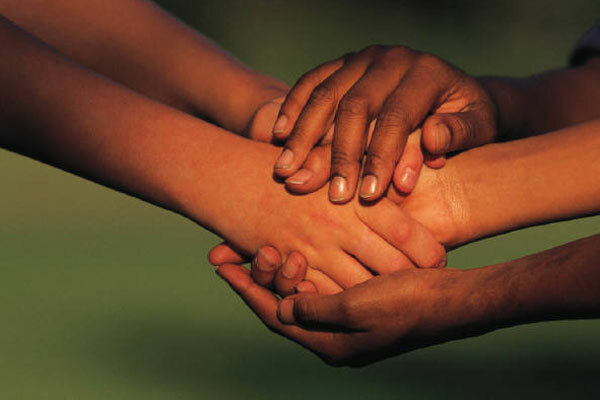 Network leadership strives to understand, shift and strengthen connectivity, facilitate alignment and resources flows, and create conditions for action in the direction of greater health at all systemic levels. Hi Curtis — thanks much for the series of reflections and articles you’ve shared on this blog! I’m writing now on behalf of http://www.dailygood.org. We would love to explore the possibility of a syndication partnership with you, so that we could cross feature articles like this one on our site. For context, DailyGood.org started more than 15 years ago as a way to spread more positive news in the world. Now it has over 240,000 daily subscribers and attracts millions of viewers to the site. It is totally commercial-free, volunteer-run, and operated by a 501(c)(3) nonprofit (ServiceSpace, also fully vol-run, and actually runs in a way that’s very resonant with a lot of what you share on this blog :)). We routinely syndicate articles from newspapers, magazines, journals and blogs and wanted to inquire if we could syndicate this article with the appropriate credits and link-back to the original article. Would you be interested in sharing your article on our platform? Either way, we’re grateful for your work in the world!